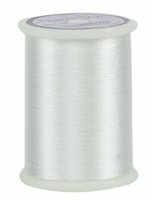 Tex 25/2-ply and Tex 15/2-ply Polyvinyl Alcohol thread. Created specifically for Basting and Trapunto. Vanish is a water-soluble thread for machine basting, hand basting, and trapunto. Store Vanish in a resealable bag in a dry place. For fastest results, use Vanish in both the top and bottom.